The Battle of the Atlantic was fought by the Royal Navy and RAF Coastal Command against the U-boats. It was a long, deadly struggle in which Hitler’s prized U-boat fleet attempted to starve Britain of food, fuel and the materials of war by destroying the convoys that kept it supplied. The effective use of depth charges by Allied aircraft demanded an attack from extremely low level, but as each submarine was armed with 10 cannons, the dangers to the aircrews was immense. The hunter becomes the hunted in a remarkable true encounter between Sunderland ‘U’of 461 Sqn and U-Boat U-461 during the Battle of the Atlantic. On 30 July 1943 Short Sunderland flying boat ‘U’ of 461 Sqn RAAF attacked and sank one of three German submarines caught on the surface in the Bay of Biscay. In an ironic twist of fate the submarine was also U-461. 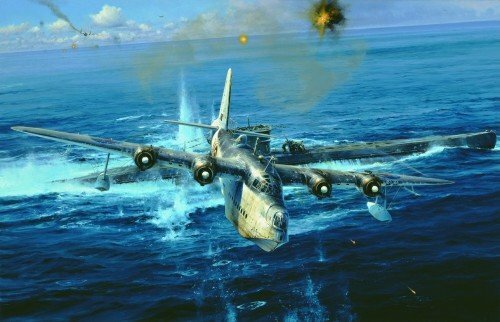 Robert Taylor’s dramatic and powerful painting depicts Sunderland ‘U’ at extremely low-level, enduring a barrage of gunfire after delivering a successful attack to sink U-461. In an instinctive act of compassion the Sunderland pilot circled the scene to drop a dingy to the U-boat survivors. This classic image is one of Robert Taylor's most powerful paintings and the signed lithograph edition is highly sought after on the secondary market so we are delighted that this breathtaking painting can now be faithfully replicated on canvas as a ‘Museum Quality’ piece to be treasured for a lifetime. Reproduced in a dramatic and imposing size this masterpiece could grace the walls of any home, study or office to create a truly commanding centerpiece!